The CS-12 Stun Master is a primarily defensive weapon which produces an extremely intense electrical shock when it encounters flesh, thereby incapacitating the receiver with minimal long-term harm. 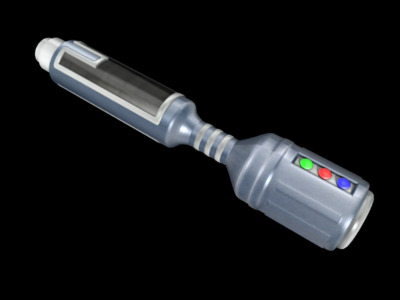 It resembles a tiny lightsaber and has more than once been incorrectly recognized as one, to the good or ill fortune of the wielder. It was designed for civilian use in self-defense, but has found a niche in several criminal organizations and special operations groups across the galaxy.